A "renaissance" in space exploration is helping drive down the cost of going to orbit and will eventually help humanity get to Mars, said several speakers at the White House Frontiers Conference. The Interplanetary track of the event, held yesterday (Oct. 13) and broadcast via live stream, featured experts from NASA and several private companies to talk about how to make space more accessible for the private sector and the general public. At SpaceX, one of the most common T-shirt slogans seen is "Occupy Mars," said Tim Hughes, SpaceX's senior vice-president and general counsel. The company has been testing reusable versions of its Falcon 9 rocket, and a few weeks ago CEO Elon Musk talked about how this technology could help create a network of ships and rockets to get to Mars. "We want to improve upon the reliability and cost of access to space to enable things to happen," Hughes said in a panel discussion. NASA, the military and the commercial space markets will all benefit from reusable rockets, he added, and SpaceX is looking forward to employing reusable vehicles, because these vessels will already have been tested in space when they go up again. SpaceX Senior Vice President and General Counsel Tim Hughes speaks during a panel discussion on entrepreneurship in space exploration at the White House Frontiers Conference Interplanetary track on Oct. 13. Some lower-cost work is already taking place on the International Space Station, NanoRacks CEO Jeffrey Manber said in the same panel discussion. His company provides shoe-box-size hardware called CubeSats to do experiments on the orbiting complex. More than 15 nations have worked with the company, and 140 CubeSats have been launched, Manber said. He added that he foresees more 3D printing taking place in the next five years, in an effort to make astronauts more self-sufficient. "I think one of the greatest accomplishments in NanoRacks is we have shown [that] a small entrepreneurial company can work with NASA," Manber added, saying that doing so has opened up opportunities for other small firms such as Made In Space, which created a 3D printer for the International Space Station. Rod Roddenberry Jr., whose father, Gene Roddenberry, created the original "Star Trek" series, opened the Interplanetary portion of the conference by talking about the connection between "Star Trek" and space exploration in the real world. He showed a segment from a video interview posted by WIRED in which U.S. President Barack Obama talked about "Star Trek." In the video, Obama said that "Star Trek" was one of his early inspirations for getting interested in space. The idea of a common goal for humanity, and a confidence in humankind's ability to solve problems, made the show enjoyable for him as a child, he said. "Even when you look back — I think there are only 20 episodes — they looped back over and over again," he joked. "But they were fun to watch." Obama said the thing he likes the most today about "Star Trek," as well as the 2015 movie "The Martian," was the emphasis on problem solving. "It showed a bunch of different people trying to solve a problem and employing creativity and grit and hard work and having confidence — if it's out there, we can figure it out," he said. After that, Virgin Galactic CEO George Whitesides gave a short keynote address about increasing access to space. His slide show included some of the earliest photos of the Earth, the moon and Saturn taken from space. He also spoke of the "planetary perspective," or the "overview effect," which refer to how a person's perspective changes when seeing the Earth from space for the first time. "Space is not far away, but it's been closed to humanity for a long time," Whitesides said. As less expensive payloads get into orbit, however, that even those people not going into space directly can benefit, he said. The explosion of CubeSat use in recent years is similar to the computer or internet revolutions because it is making space accessible for "1,000 different uses," Whitesides said. Some common implementations include communications, Earth photography for applications like disaster management or agriculture, and taking measurements of Earth with instruments like magnetometers. But government regulation will need to catch up with the industry, said Bob Richards, CEO of Moon Express, during the panel discussion. His company was recently granted the world's first government authorization for a private moon landing. "There is no Department of the Moon that can say 'yes' to us," he joked, adding that the authorization was possible only through a collaboration among the U.S. Department of State, NASA and others. While the authorization was appreciated, it's a one-time thing that cannot be repeated unless Moon Express goes back for approval, he said. 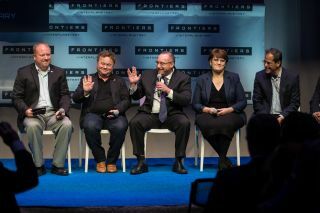 The Frontiers Conference covers five different fields that could benefit from U.S. science and innovation, said the event's founders: personal, local, national, global and interplanetary. The conference is co-sponsored by the White House, Carnegie Mellon University and the University of Pittsburgh.